wage war, has never been amended. "Now, within each party, there seems to be a reliable set of supporters for amending the Constitution, while the number of those who oppose it is on the decline. ... One way or the other, today's political focus and the heated debate on the Constitution is forcing Japan to confront this issue and act." Japan Prime Minister Shinzo Abe: As friction with China and North Korea grows, Abe, the most right-wing Japanese leader in years, wants to revise Japan's post-war constitution for the first time. After decades as one of the world's most peaceful nations, can Japan again be trusted to have a national military? With China's continuing attempts to expand its maritime jurisdiction on one side, and a nuclear-armed North Korea on the other, peace and stability in the Far East is at stake. Amid imminent danger and existing threats, the Liberal Democratic Party (LDP), headed by Prime Minister Shinzo Abe - who seeks a comprehensive revision of the Constitution - won a historic landslide victory in the general election and has been returned to power. The idea of revising the Constitution appears increasingly realistic. Abe has laid down guidelines for the current debate on amending the Constitution, saying that above all, the focus should be on revising Article 96, which outlines the requirements for initiating constitutional amendments. 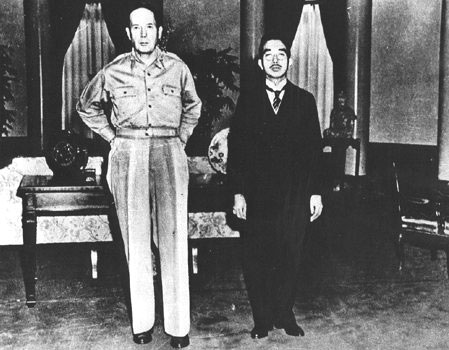 In a Diet session at the end of January, Abe clearly stated, "The first thing we have to do is work on revising Article 96, which is something many parties and factions feel is necessary." [Editor's Note: Article 96 says that amendments require the approval of two-thirds of the members of both houses of the National Diet, before they can be presented to the people in a referendum]. The central focus for amending the Constitution is Article 9, which renounces the waging of war "as a sovereign right of the nation." But because he believes that revising the procedure for amending the Constitution will win wider approval than dealing with any specific issue, Abe emphasized that before dealing with Article 9, his administration would move to weaken the provisions of Article 96. The draft constitutional amendment submitted by the LDP last April calls for a revision of Article 96, so that the number of votes necessary for approving a constitutional amendment would be cut from at least two-thirds of both houses of the National Diet to a simple majority in each chamber. 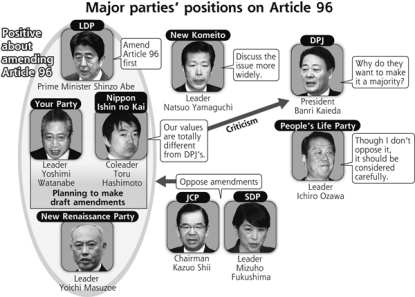 In June 2011, a parliamentary group was established by a number of Diet members, headed by the then-ruling Democratic Party and LDP, the sole purpose of which is to pursue a revision of Article 96. It welcomed as advisers the last three prime ministers - Yoshiro Mori, Taro Aso and Shinzo Abe. At its first meeting, there were participants from the People's New Party, New Komeito, Your Party, and non-partisan groups. It has been reported that there were a total of 100 participants and 200 of their supporters present. Now, within each party, there seems to be a reliable set of supporters for amending the Constitution, while the number of those who oppose it is on the decline. Further, with conservatives playing the largest and most influential role in the Diet, it cannot be said that amending the Constitution is exclusively Abe's personal agenda or that of the LDP. 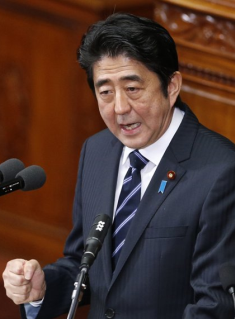 On the issue of the right to collective self defense, Abe told the Diet, "I am determined to find an appropriate way to respond to the current national security environment." He also mentioned revisiting the constitutional interpretation put forward by Zenko Suzuki's cabinet in 1981, that while Japan has the right to individual and collective self-defense under international law, it cannot exercise that right because of its pacifist Constitution. While this movement may be welcomed in the Diet, it is an open question whether this reflects public opinion. In the last general election, the LDP made no direct comments about the debate on amending the Constitution. Instead, it focused on the importance of economic recovery as a strategy to win votes. For Abe to stabilize his administration, it is crucial to his cabinet that the LDP not only win the House of Councilors elections this summer, but that it carefully handle the debate on amending the Constitution. It has been 66 years since the Constitution was imposed in 1947, and it has been six years since the National Referendum Law was enacted. One way or the other, today's political focus and the heated debate on the Constitution is forcing Japan to confront this issue and act.